(570) 286-0818 Call to register! Beginners are encouraged to enroll. Session #1 Jan - 2015 concluded. Session #2 Mar - 2015 concluded. Session #3	Apr 27 - Jun 1: concluded. 6 week session. 2 week break between sessions. Basics of preparing to paint outside. What to take. What to wear. How to set up. Getting started. Will discuss various materials and set ups. Demo for watercolor media. The Merrill Linn Conservancy, the Lewisburg Arts Council, and the Artists’ Guild of Lewisburg are pleased to sponsor their SECOND PLEIN AIR EVENT, to be held Sunday, April 26, 2015. A painting done outside rather than in a studio. The term comes from the French en plein air, meaning “in the open air.” The Impressionists, in the late 1800s, were particularly interested in the influence that changing light outdoors had on color. The term “plein air painting,” as it is currently used, usually refers to paintings that are completed on location. The goal of this event is to preserve, with our artwork, a present moment at various Linn Conservancy sites. And, in sharing the work we create, to build a community of artists and citizens passionate about the preservation of these sites for future generations. This free event is open to everyone, artists and art-lovers alike. Sunday, April 26, 2015, 9 a.m. to 6 p.m. If it rains, artists will be welcome to visit the sites during the following week and present their artwork for display at The Public Library for Union County. Each of these sites will be accessible from 9 a.m. to 4 p.m. A PDF with directions to and descriptions of each site is available here. Volunteers will be posted at each site to assist artists. 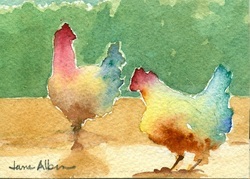 Visit Jane’s website, janealbin.com, to learn more about the artist and to see her work. Participants may attend the workshop and then find locations on the DEW property or go to other sites to work on their own projects. Artists who choose not to attend the workshop may begin entering the above-listed properties no earlier than 9 a.m.
SPACE FOR THE PLEIN AIR WORKSHOP IS LIMITED. REGISTRATION IS REQUIRED. Please email lbgartsfestivalworkshops@gmail.com or call Vicki Heberlig at 570-523-3128 to register. There is no registration fee. 9 a.m. – 4 p.m.: Artists work at their chosen locations. You may stay in one place or travel to different locations. The three sites are within reasonable distance of one another. 4 p.m. – 6 p .m. : A light appetizer reception back at the Dale Engle Walker Property. Please bring your artwork back to the reception to share with others, even if it isn’t completed. After the Event: The plein air artwork will be displayed at The Public Library for Union County during the month of June. Guidelines giving specifics on mounting and framing for this display will be available on the Lewisburg Arts Council website and will be included in participants’ packets the day of the event.